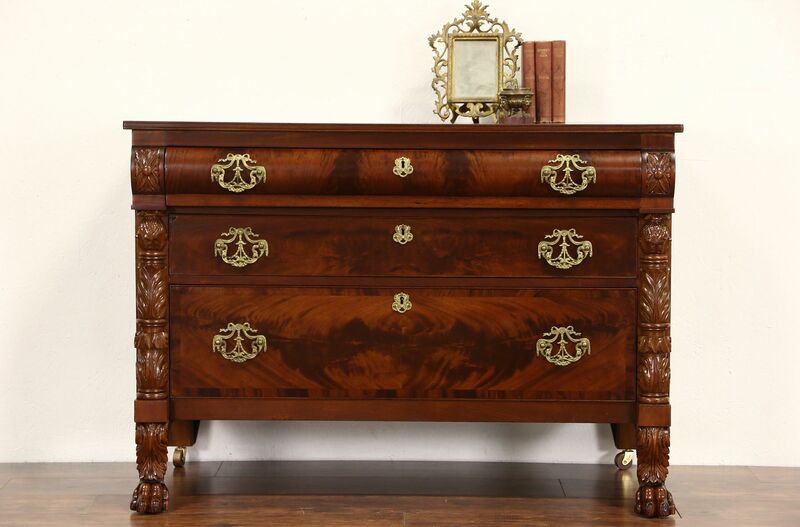 A wonderful Empire period line chest or dresser was hand carved of mahogany about 1840 with classical lion paw feet and acanthus columns. Drawers have bold flame grain fronts. Drawers have hand cut dovetail joints and chamfered bottoms. Rear brass wheels also appear original. The restored finish is in excellent condition on this American made antique furniture. There are minor shrinkage separations from age. On the back of the matching piece is a card from around 1880, inscribed "Restored by Ernest F. Hagen, Dealer in Antique Furniture, 213 E. 26th St, New York." Lavish cast brass hardware probably dates from that restoration. Size is 48" wide, 24" deep and 33 1/2" tall. Matching Tall Chest priced separately, call or email for availability.